Calling all Drum Corps International Super Fans! Are you more insane than a shirtless Green Bay Packers fan during a sleeting December game? More loyal than Canadians to the puck and ice? More obsessive than a Yankees fan in October? It's a well understood fact that drum corps enthusiasts are among the most passionate fans on the face of the Earth, and this year your fanatic love for the marching arts can get you super prizes, super access and super discounts in Indianapolis during next week's World Championships. Throughout the week, be sure to wear your Super Fan badge with pride inside and outside the stadium, because in addition to identifying yourself to the thousands of other drum corps enthusiasts that will invade the city of Indianapolis, you'll have the chance to win great prizes! The official DCI Stadium Squad will be out and about in the stadium and throughout Indianapolis, looking for the most passionate Super Fans to award prizes to. Win big just by wearing your badge! When registering as Super Fans, drum corps alumni of any year and corps will be asked to affix the gold "DCI Alumni" sticker to their badges. Following the World Class Semifinals on Friday, Aug. 7 at Lucas Oil Stadium, those Super Fans with the gold sticker will have the exciting opportunity to head down on the field following the World Class Semifinals competition to welcome the age-out class of 2009 into their alumni ranks. Interested alums should gather in the marketplace area after the show to gain access to the field for this unique opportunity. Keep an ear out during the Semifinals event for informational announcements. Following the World Class Quarterfinals, you can join the production crew, DCI staff and other fans at the famous Hard Rock Caf?© to celebrate the very first "Big, Loud and Live" broadcast shot and produced entirely in high definition. Dodge the paparazzi and keep your eyes open on this red carpet, because as with any celebrity party, you never know who will show up! After the World Class Semifinals and Finals on Friday and Saturday, August 7 and 8, head over to the Super Fan and Alumni Party Headquarters, the Slippery Noodle, for two more parties just a few blocks away from Lucas Oil Stadium. Enjoy great food and drinks while celebrating the excitement of the 2009 World Championships with friends old and new. And if you need a short diversion from all of the drum corps action, your DCI Super Fan badge will save you money at many popular local attractions during the week, many that are within walking distance of Lucas Oil Stadium. For even more discounts, check out VisitIndy.com/coupons. Psyched about becoming a Super Fan? Great! 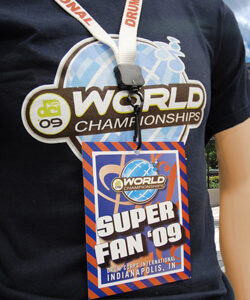 Remember, all you need to do is register at the DCI Welcome Center, located in the Lucas Oil Plaza just as you enter Lucas Oil Stadium at next week's World Championship events to receive your FREE Super Fan badge.